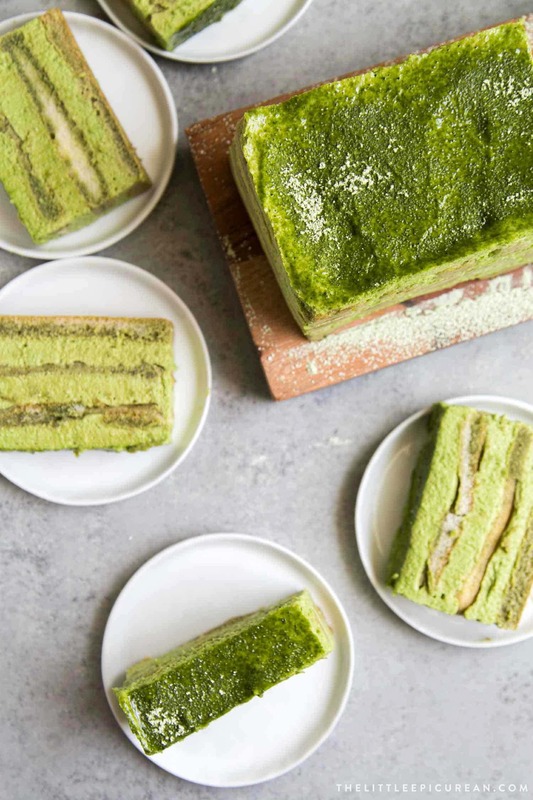 This sliceable matcha tiramisu cake features ladyfingers soaked in matcha-marsala wine layered with matcha mascarpone cream. This is the last of the matcha series before I leave for Japan. I’m sure I’ll come back inspired with all sorts of new matcha recipe ideas! We started with these easy matcha madeleines. Then we took it up a notch with these matcha cream puffs. And for the grand finale, I present you this matcha tiramisu! I have made classic tiramisu dozens of times. It’s hard to tire of tiramisu especially when it’s name translates to “pick me up.” Who doesn’t love a pick me up every now and then? Eventually, I built up some courage and veered from the classic with this six layer tiramisu cake. Today, I’ve really gone adventurous by mixing together Japanese and Italian flavors to create this matcha tiramisu. As ode to the traditional tiramisu, I have incorporated several of the key components of the original. This matcha version is made with ladyfingers, marsala wine, and mascarpone blended with sabayon. In traditional tiramisu, ladyfinger cookies are soaked in a liquid mixture of espresso and marsala wine. I simply swapped out the espresso for high quality matcha. 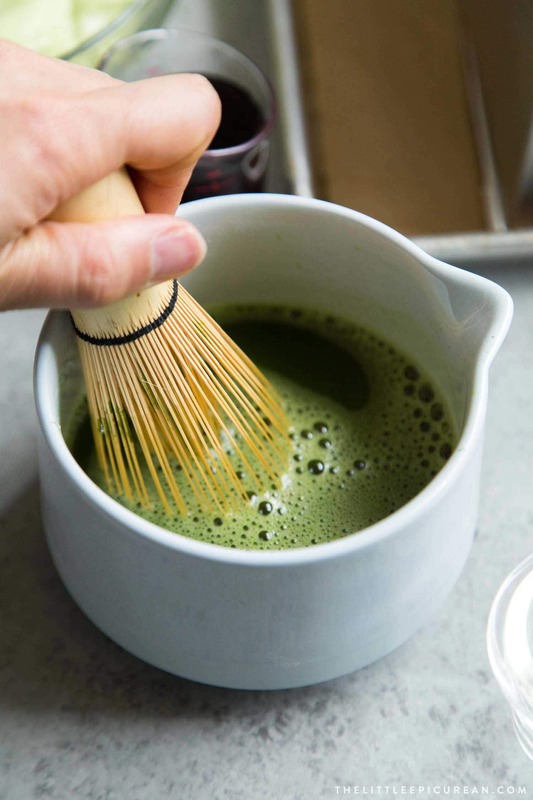 It is vital that you use high quality matcha. Poor quality matcha is rather bitter in flavor, and it will throw off balance of the marsala. Not all matcha powders are created equal. Some are much more greener than other. Some are more grassy, some are rather bland. Read up on my matcha recommendation in this matcha sugar cookie recipe. There are two varieties of marsala wine: dry and sweet. Marsala is named after the region of Italy where the wine is produce. Both varieties can be used for sweet or savory applications. The wine can also be served as an aperitif or chilled for an after dinner drink. Dry marsala wine is often used in risottos. But it’s most popularly used for chicken marsala. Sweet marsala is typically used for tiramisu and zabaglione (sabayon). I have tested this recipe using both dry and sweet marsala. Either will work just fine. The mold is lined with acetate cake collar. These acetate strips come in a variety of sizes. I had to tape two together to accommodate the height of this matcha tiramisu. This tiramisu has three components: ladyfingers, matcha marsala soaking mixture, and matcha mascarpone filling. The dry ladyfingers will soften much more quickly and efficiently if the matcha marsala soaking mixture is warm. If this mixture cools during assembly, I like to zap it in the microwave for a few seconds. This most laborious part of this tiramisu cake is preparing the matcha mascarpone mixture. Because this tiramisu is sliceable, it requires a little help. This tiramisu is stable because of the addition of gelatin. For this recipe, I used unflavored powdered gelatin. The gelatin strengthens the matcha mascarpone mixture, giving it the ability to hold it’s shape. 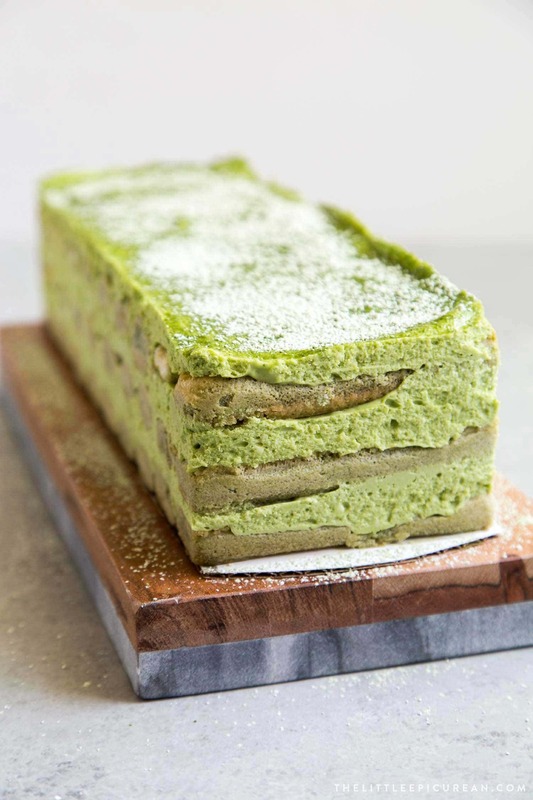 As such, this matcha tiramisu can stand up like a cake at room temperature. 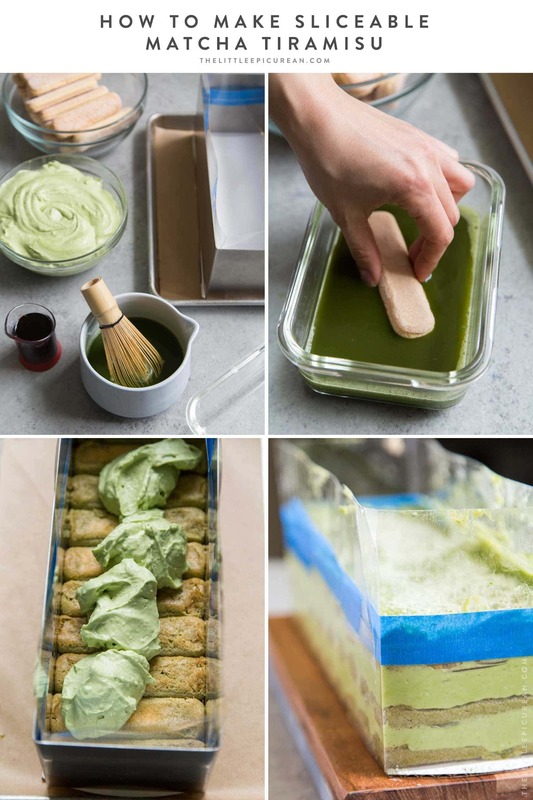 If you prefer not to use gelatin, simply build and assemble the matcha tiramisu in a standard casserole dish or baking pan. The gelatin simply allows the tiramisu to be sliceable like cake. Asides from powdered gelatin, gelatin sheets, collagen or agar-agar can be used in its place. However, you will have to adjust the amount needed. 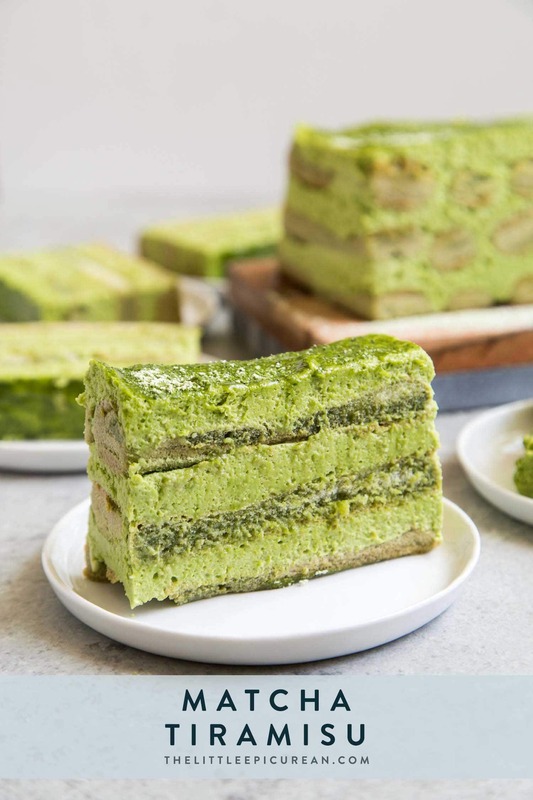 This matcha tiramisu cake is by far my most favorite matcha dessert I have ever shared on the blog. 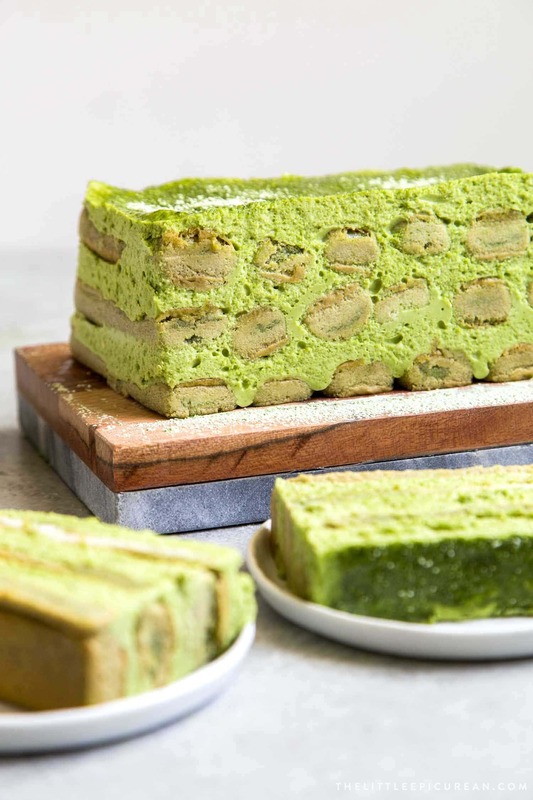 I love it even more than this matcha red bean cake and matcha strawberry swiss roll cake. That’s saying a lot! In a small bowl, sprinkle gelatin powder over cold water. Let mixture sit for 3 minutes. Microwave mixture at full power for 20-40 seconds until mixture is liquid. Stir until completely dissolved. Set aside. In bowl of a stand mixer combined sugar, egg yolks, and egg. Place bowl over a pot of barely simmering water (ensure bowl does not touch water). Continually whisk mixture until pale in color, slightly thickened, and until mixture reaches a temperature of 140 degrees F. Remove from heat. Place bowl in stand mixer fitted with whisk attachment. Sift in matcha powder. Whip on medium speed until mixture has cooled to room temperature. Stop machine and add the mascarpone in two additions. Whisk on medium speed until smooth. Add melted gelatin mixture. Whisk on low speed until incorporated. Sift matcha powder into a small bowl. Add about 1/4 cup hot water. Whisk vigorously using a matcha whisk or small whisk until smooth and frothy. Add remaining hot water and stir until combined. Add in marsala wine. Set aside. Line 11.5 x 4 x 4-inch rectangular frame mold with acetate sheet. You may have to tape two acetate sheets together to accommodate the height of the mold. Set lined mold over rectangular cake board or small baking sheet. Dip each ladyfinger in warm match marsala syrup for 2-3 seconds on each side. Do not soak the ladyfinger, otherwise it will soften too much. Place a row of 10 dipped ladyfingers in bottom of prepared mold. 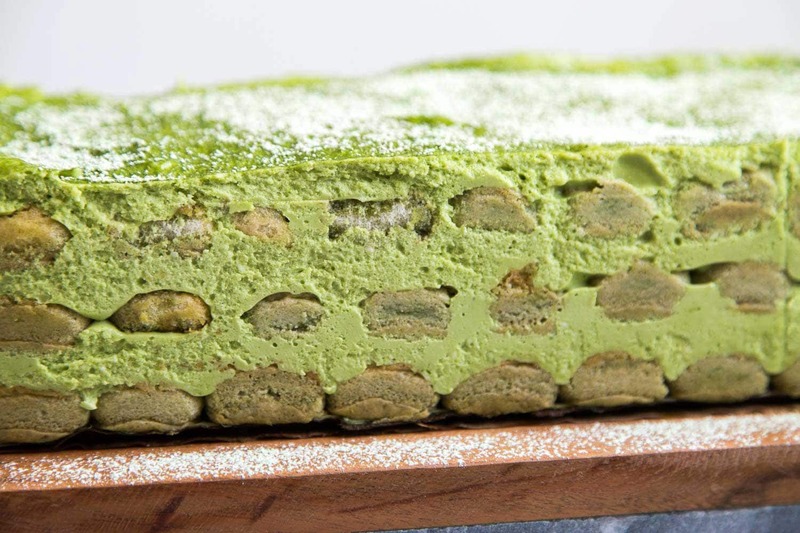 Spread a rounded 1 cup of matcha mascarpone filling in an even layer over ladyfingers. Repeat second layer of dipped ladyfingers, followed with another rounded cup of filling. Add third layer of dipped ladyfingers and finish with remaining matcha mascarpone filling. Smooth the top layer using the back of a spoon or a mini offset spatula. Cover assembled tiramisu with plastic wrap. Let chill in the fridge for at least 2 hours, up to overnight. Remove plastic wrap. Gently remove metal frame mold and gently remove acetate sheet from tiramisu. In a small bowl, combine powdered sugar and matcha powder. Dust the surface of matcha tiramisu with matcha sugar mixture using a sifter. Use a serrated knife or chef's knife to slice tiramisu into individual servings. 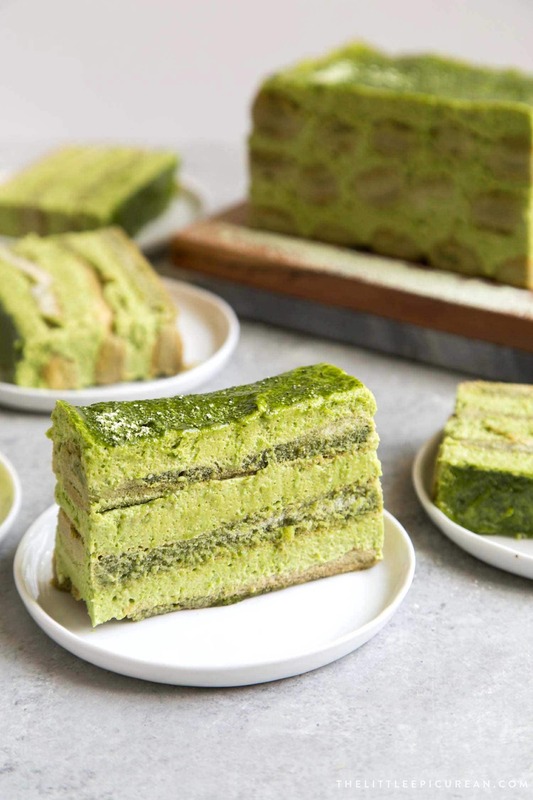 Serve matcha tiramisu cold or at room temperature. I use these ladyfingers. They are available in large packages at Smart and Final and Restaurant Depot. Either dry or sweet marsala wine can be used in this recipe. I have tried both with similar results. I recommend this instant read digital kitchen thermometer. I recommend the barista matcha powder from Rishi Tea.